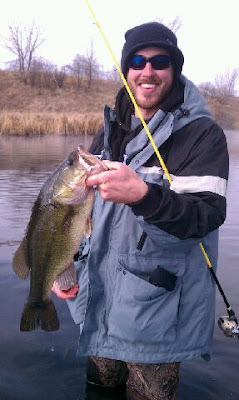 This past weekend I was fortunate to catch open water largemouth, a rarity during the winter months in Minnesota. I won't disclose the location, but you already new that. How often does a bass fisherman relinquish his favorite honey holes?What I can tell you is how I caught them. A wacky rigged Tonka Tackle Dead Stick. The wacky rig is one of the most simplistic set ups in bass fishing. It is literally using a hook to bisect the middle of a plastic worm. One of the most effective ways to fish this bait is to just let the worm fall on slack line. The action is subtle and enticing. Typically, I use 6-8 lbs fluorocarbon line to make the presentation as natural as possible. 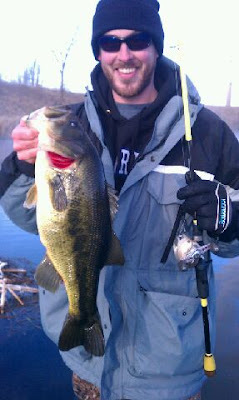 This past weekend I bulked up to 15 lbs line, as the fish proved that my 6 lbs line was a bit skimpy. This weekend brought up an interesting topic of conversation regarding fishing lures. Is there a bait or presentation out there that you will not use because you feel it is too cliche? As an example, my buddy Dan smirked when I mentioned that I was planning on throwing the wacky rig if the fishing got tough. In fact, I was confident that I would be making casts with this set up at some point, so I had a rod pre-rigged for just the right time. After prodding Dan a bit about his smirk, we came to the conclusion that some baits reek of simplicity and ease of use. This in turn leads some anglers to disregard certain presentations, in my opinion, because they don't want to seem elementary. Or, they want to be creative, innovative, and technical with their lure choices. So how do we make a worm on a hook creative? How can we modify a spinnerbait to gain the extra edge? How can we feel comfortable as anglers and competitors casting the simple lures, when we are always trying to find the latest and greatest, new high-tech lure? I believe that all lures can be modified to create a unique presentation each day out on the water. For example, the placement of the hook on a wacky rig directly affects the direction and rate of fall of the worm. We can change the type of worm we use: floating, sinking, large, small. Colors, scents, and dyes can all play a very important role in finding the pattern that takes home the cash. The bottom line--we always fish to catch big fish. Whether you catch them on an Alabama rig, swimbait, or Tonka Tackle Dead Stick, who cares. The only thing that matters is what you bring to the weigh in tent. Next time you rummage through your tackle box and are thinking of what bait to try next, pick the one that you have discarded as the inglorious fish catcher. The one you put away when you bought that $20 dog walking lure. The one that calls your name and catches your eye every time you glance past it, recalling that one big fish you will always remember. Pick that lure and hold on... I sure did.